The day before Christmas this box showed up on my step after being on pre-order from Amazon forever. I posted this on Instagram. I couldn't figure out what I ordered that required such an enormous box. Amazon must have run out of small boxes by this point in the Christmas shipping chaos. 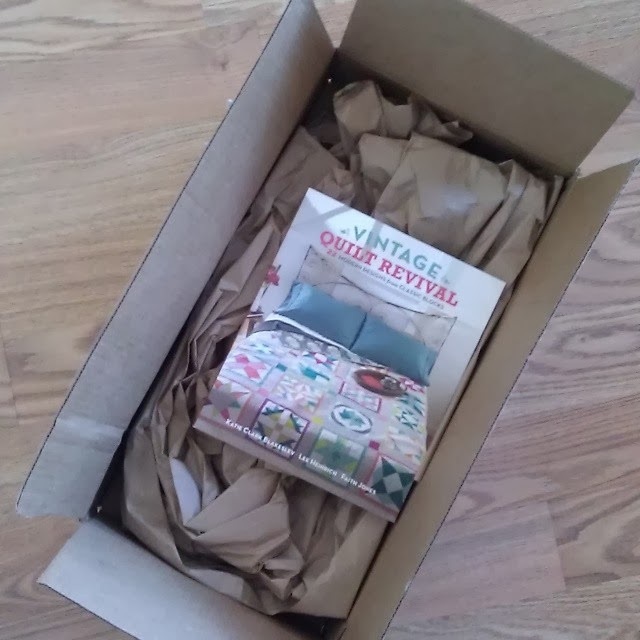 Inside I was thrilled to find the Vintage Quilt Revival book I had been anxiously awaiting. Many of you have likely heard of this book already. It's written by Katie from Swim, Bike, Quilt, Faith from Fresh Lemons, and Lee from Freshly Pieced. I've met each of these talented women on several occasions and am continually impressed by their work. I had high expectations for this book considering what they have individually created in the past. I wasn't disappointed. I love the idea behind this book. The authors demonstrate 20 traditional blocks with ideas and projects for each block. Three different samplers with the blocks are included at the end. My very favorite quilt in the book is the Star Bright Quilt. It's on my list to make. I also love the Cut Glass Baby Quilt. So, now back to the title of this post. 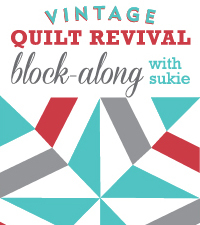 My quilting friend, Sukie is hosting a Vintage Quilt Revival Block-Along. Sukie will work through two blocks each week and post any tips or tricks on her blog in a weekly post starting Tuesday, January 21. There will be a link-up each week for those who have completed the blocks as well as a Flickr group. (You will need a copy of the book to participate as specific instructions aren't included on the sew-along posts). Botanics by Carolyn Friedlander-- I'm not sure if I'd use a white or a grey background on this one. 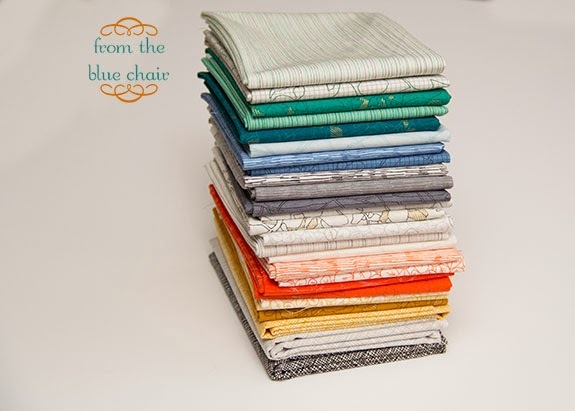 True Colors by Anna Maria Horner--I'd probably use a neutral linen background with this stack such as Yarn-Dyed Essex in Flax (my absolute favorite). 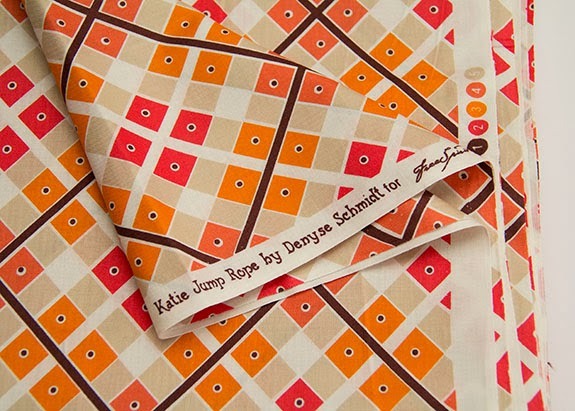 I have five yards of this print from Katie Jump Rope that I'd like to use as a backing. This is one of my favorite prints from this fantastic (and sadly very-hard-to-find) line. 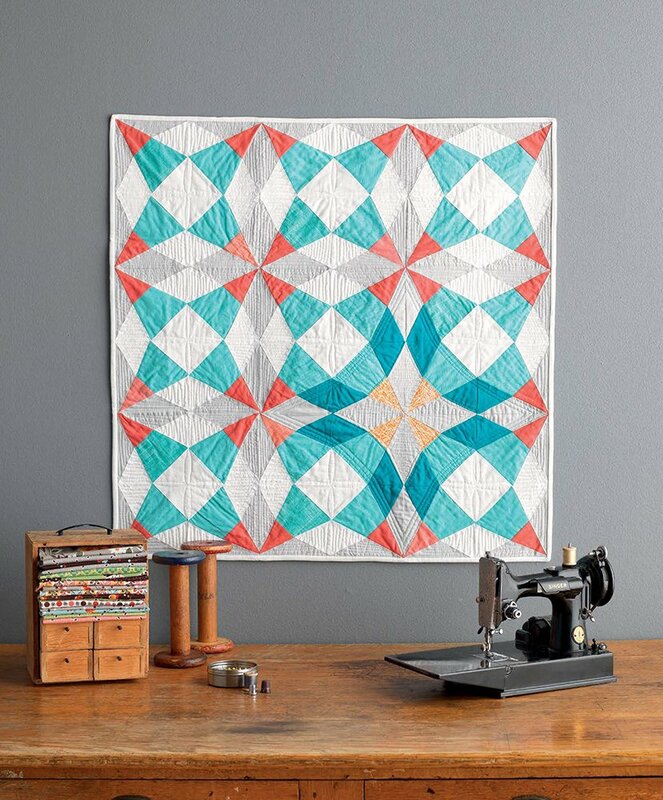 My final option is pulling colors from this print and making a more scrappy version of the quilt with oranges, neutrals and red. Which option would you choose? I'm having a hard time deciding. That is a hard choice as all of them I like. I would go with Choice 3 and then 1. #1 I think it would be awesome. I think your option #3 would make up into the Cut Glass Baby Quilt just perfectly. Making that pop area in the bottom right corner into the red family and the rest in the orange/yellow family. Love the Botanics line! Wish I had a stack of it to slice into! Ooh! Such fun choices. My gut tells me to go with Botanics since there are a lot of lighter valued prints in that one. I think it would give you more versatility when sewing the blocks. They are all great, though! So I am clearly in the minority with option 2! I'd be all over the Katie Jump Rope!! I think it depends on what you want as a final product. Option 1 would look almost exactly like the original, which means you would know what the final outcome would be, with that surprise of color on the back. Opt 2 would be more daring and would definitely be a conversation starter and it would blend nicely with the backing. There, did that help? Woot! Glad you're joining us!!! I don't see how you can go wrong with any of these choices. 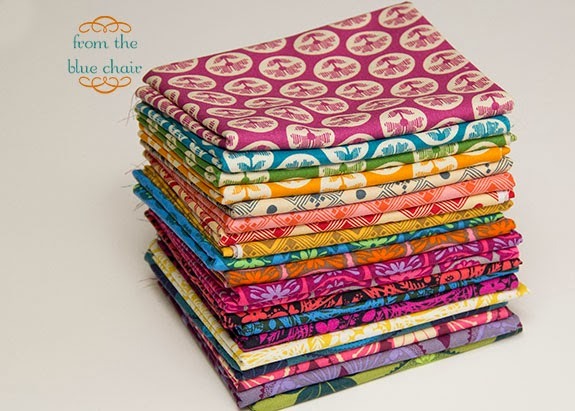 Fantastic fabrics!